People: Take the damn joke as the irony of someone who wasn't entirely black being placed with an ad for such. It's a joke so freakin deal with it and stop pointing out insignificant flaws in whatever argument. Damn. 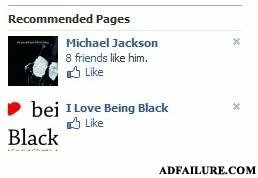 the add at the top of my page: "top brown spot creams"
Michael Jackson had vitiligo. Google it. That's why he became white, not surgeries. hey im in that group!!! To the people that dissed him your lame. Everybody knows he had vitiligo, and so he had his skin evened out evertime the blotches got whiter. He already said he loved being black. If you people were smart you'd know that vitiligo can NOT be controlled and takes over your skin. As for his nose jobs so people get em everyday it aint nothin new!